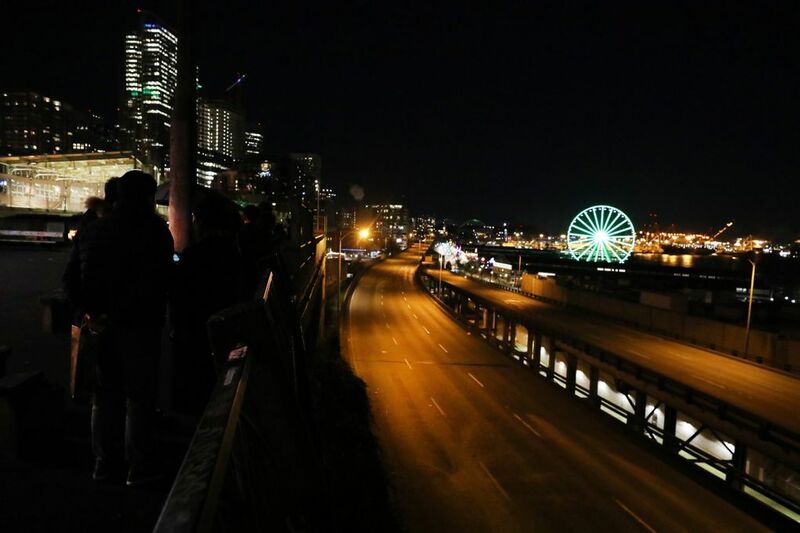 After a relatively smooth opening day Monday, transportation officials warned the public to brace for gridlock midweek, as the Seattle area reacts to the permanent closure of the Alaskan Way Viaduct. 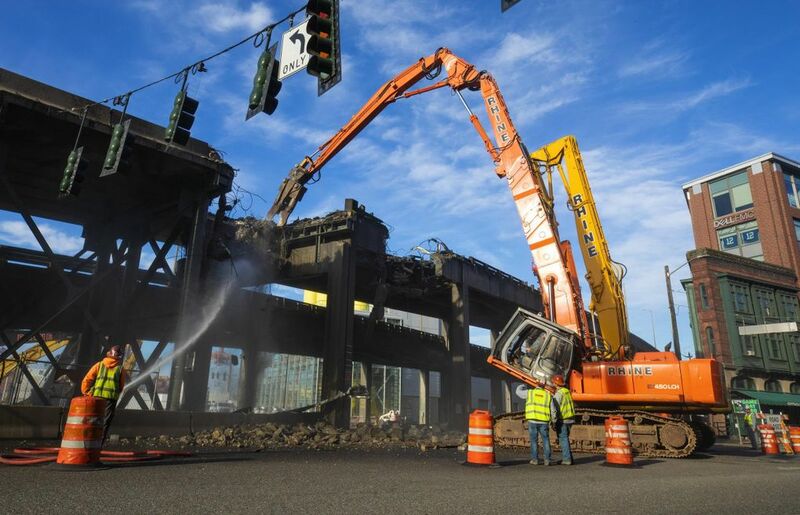 After a manageable Monday, commuters are warned to expect longer delays during Seattle’s three-week Highway 99 closure, as rain moves in by Thursday and people who stayed home return to the highways. 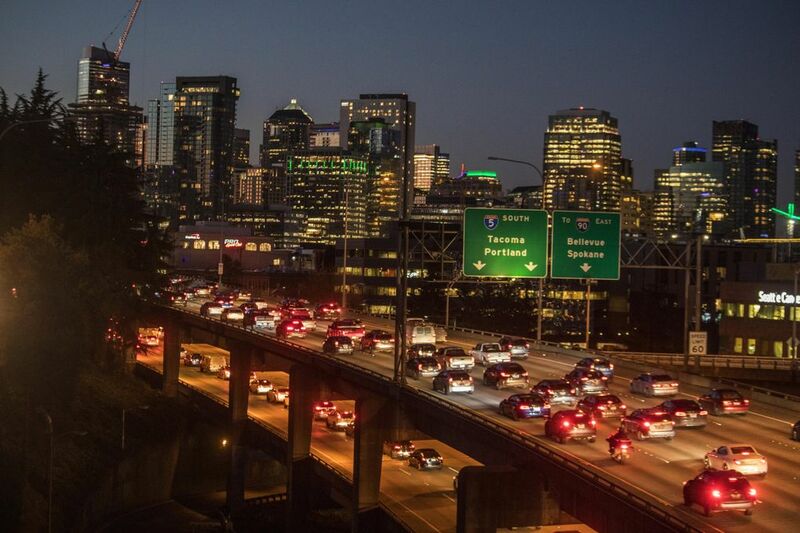 “City commuters and travelers should not go back to their pre-viaduct habits — that will be the road down to another traffic problem,” said Heather Marx, downtown mobility director for the Seattle Department of Transportation (SDOT). 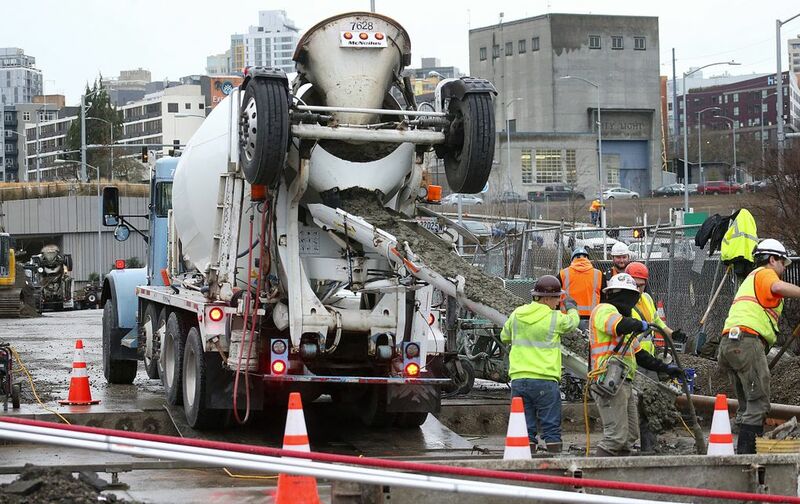 The state permanently closed the 66-year-old Alaskan Way Viaduct late Friday, but a new four-lane bypass tunnel beneath downtown won’t open until the week of Feb. 4, and another week will pass before the Sodo interchange is complete for northbound drivers to exit near the stadiums and ferry terminal. 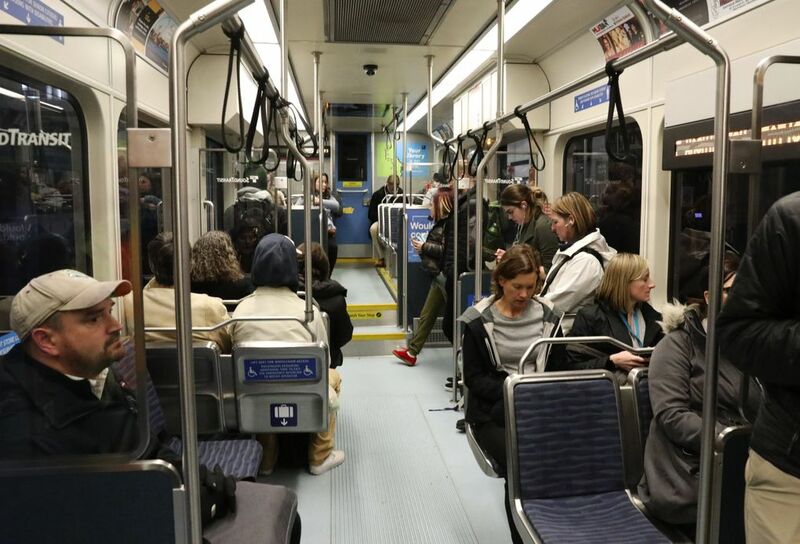 Some 90,000 daily drivers and about 25,000 transit riders must either detour or avoid trips. 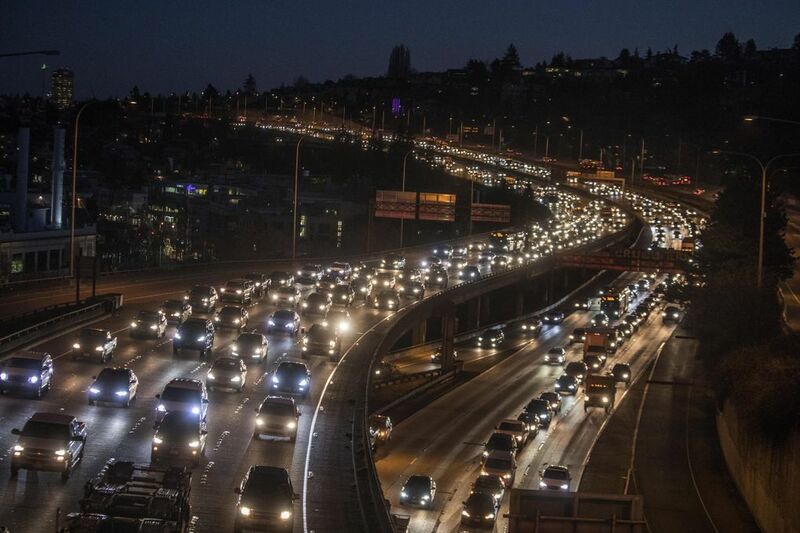 How was your commute? Let us know! 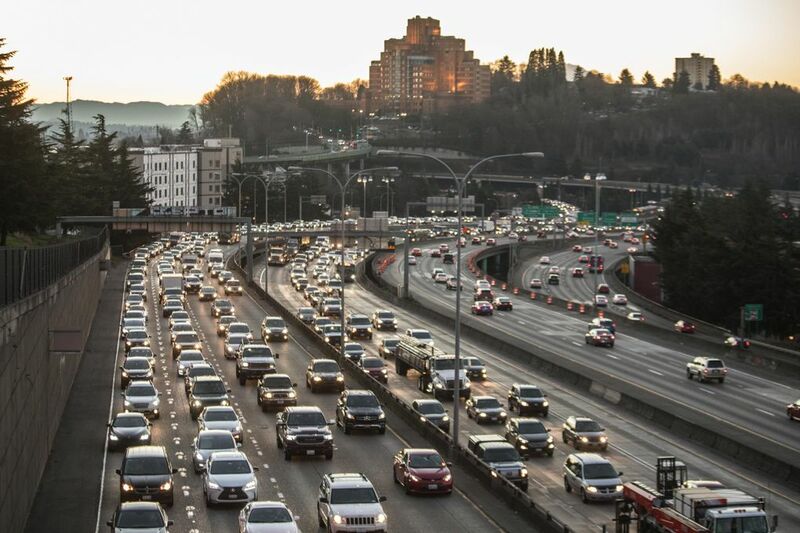 Monday afternoon traffic flowed in the city without major problems, except for crowding on the West Seattle Bridge route, where about one-third of the traffic is diverted by barricades from Highway 99 ramps. 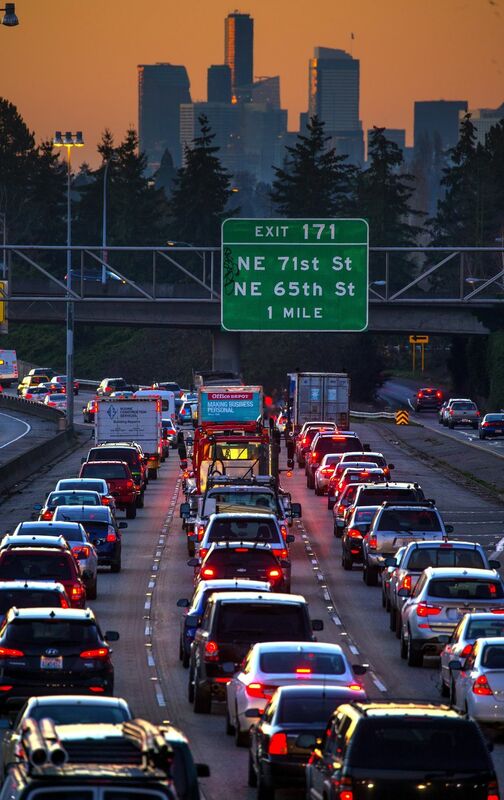 A brief two-mile backup resulted from an Interstate 5 crash near Federal Way. 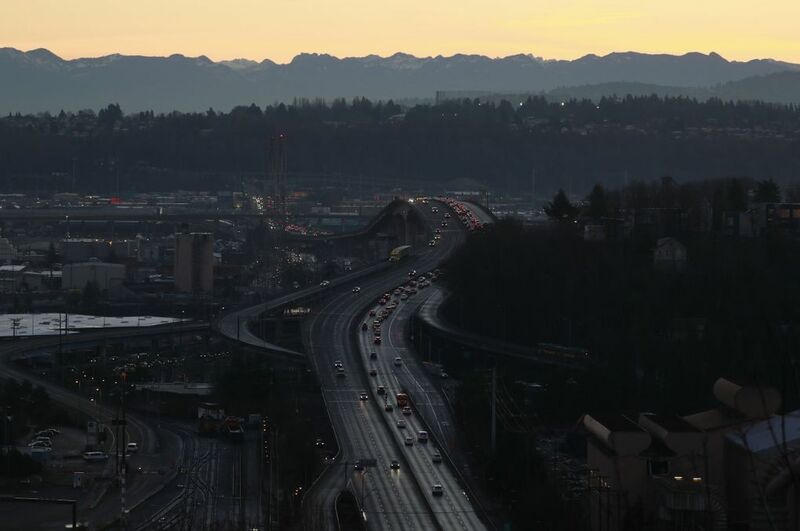 To prepare for Tuesday morning, SDOT will apply road salt in places to prevent icing, Marx said. 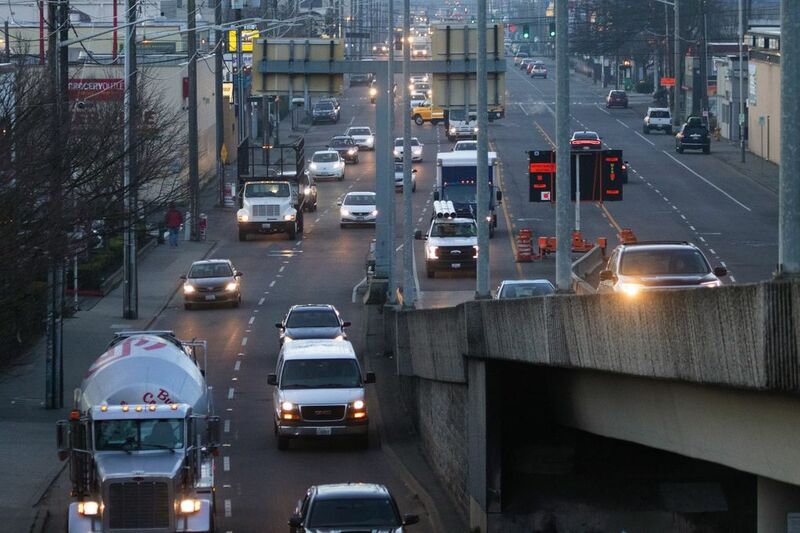 Signal timing on First Avenue South may again be adjusted to favor north-south traffic more than usual. Parking restrictions will increase on Airport Way South at Georgetown, a favorite and sometimes clogged escape route from I-5 congestion. “Pay attention to the signage, because we are not going to be shy about citations and towing,” she said. 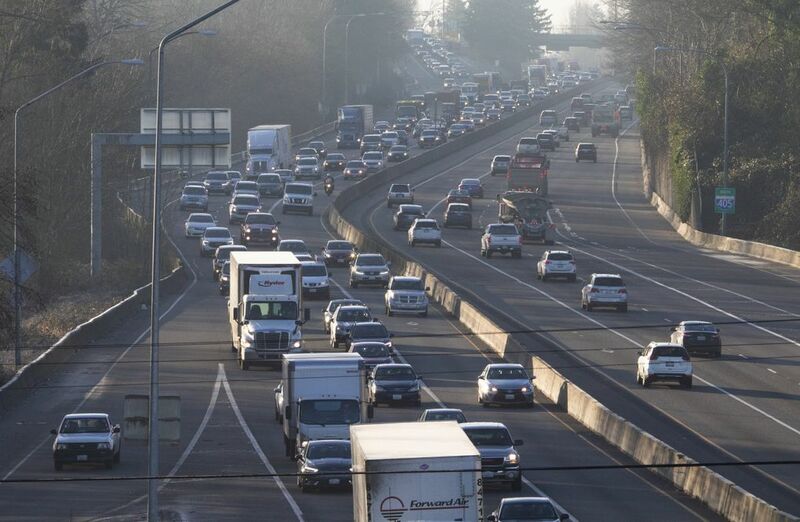 Drivers followed transportation agencies’ advice Monday morning to leave an hour early — which mainly led to traffic snarls starting an hour sooner and ending one hour sooner in Lynnwood, Federal Way and West Seattle. 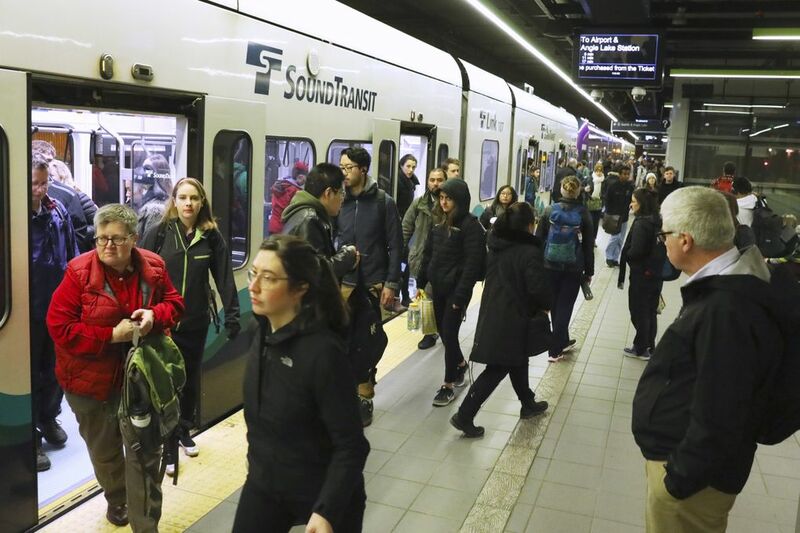 State ferries reported fewer vehicles and walk-on riders, while Sound Transit reported no surges on either Sounder commuter trains or Link light rail, unlike past highway shutdowns. 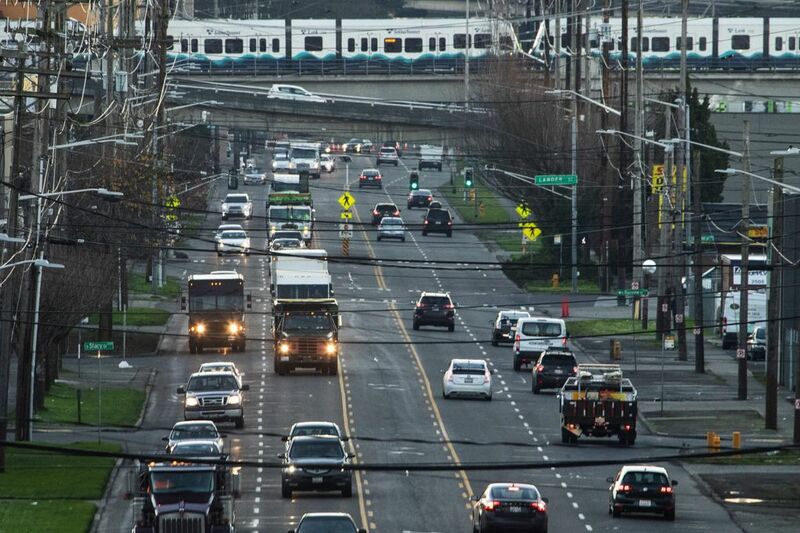 First and Second Avenues entering Seattle were relatively empty. That’s another sign people took a three-day weekend or telecommuted. 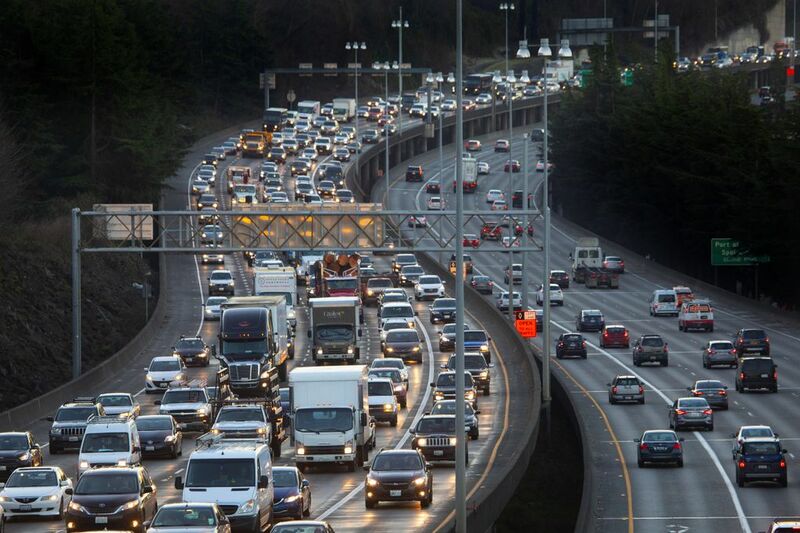 Despite the loss of highway capacity, delays regionwide were only about 20 minutes more than normal, peaking around 6:15 a.m., followed by delays of less than 10 minutes in most areas, said Morgan Balogh, regional traffic engineer for the Washington State Department of Transportation (WSDOT). 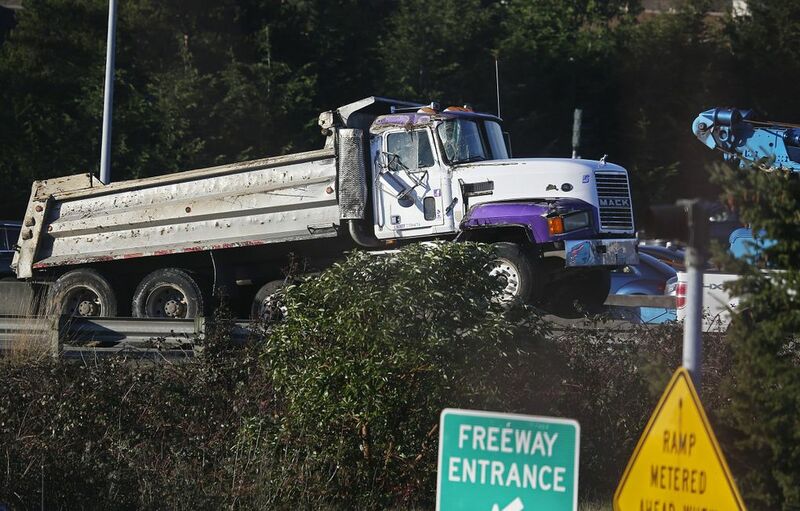 Two exceptions were on Interstate 405, where a southbound crash north of Bothell blocked two lanes at 6:15 a.m., and in Renton where a 38-minute trip still required 53 minutes by 8:30 a.m.
Dave Sowers, deputy Highway 99 administrator for WSDOT, mentioned rain in the forecast, while Seattle Mayor Jenny Durkan stressed that unforeseen blockages or problems are bound to happen in these multiweek traffic disruptions. 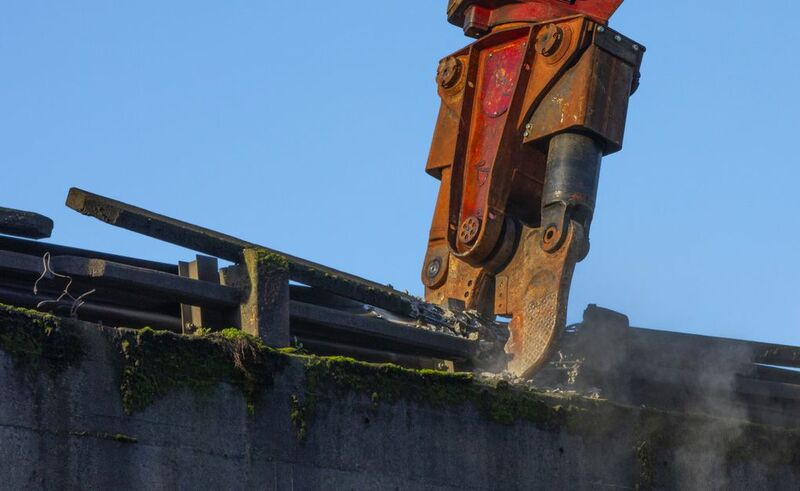 As for Monday afternoon, city engineers watched the usual hot spots where drivers leave downtown, said Matt Beaulieu, SDOT transportation operations manager. 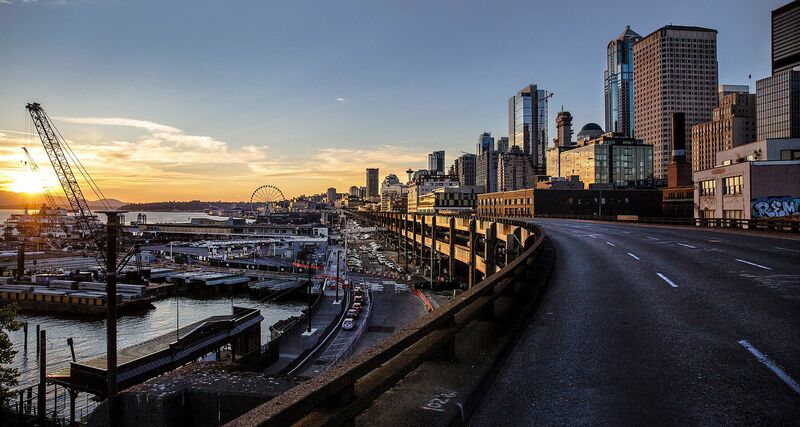 These would typically include Denny Way onto Aurora Avenue North, the Howell Street corridor toward the northbound I-5 express lanes and southbound I-5, or the Sodo area around Interstate 90, southbound I-5, Fourth Avenue South and Edgar Martinez Drive. 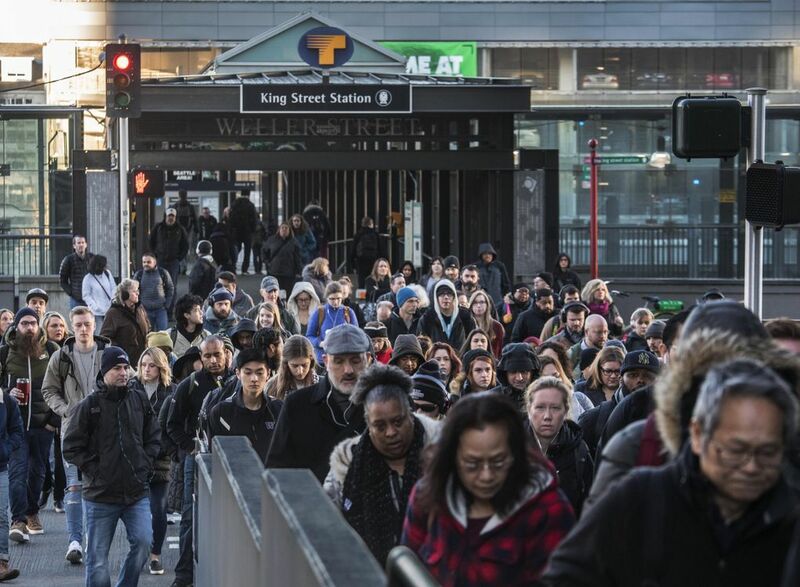 Traffic police were dispatched to many intersections, notably Sixth Avenue near Battery Street, where the red bus lane tends to clog with general traffic and delay Aurora bus routes, such as the E Line. 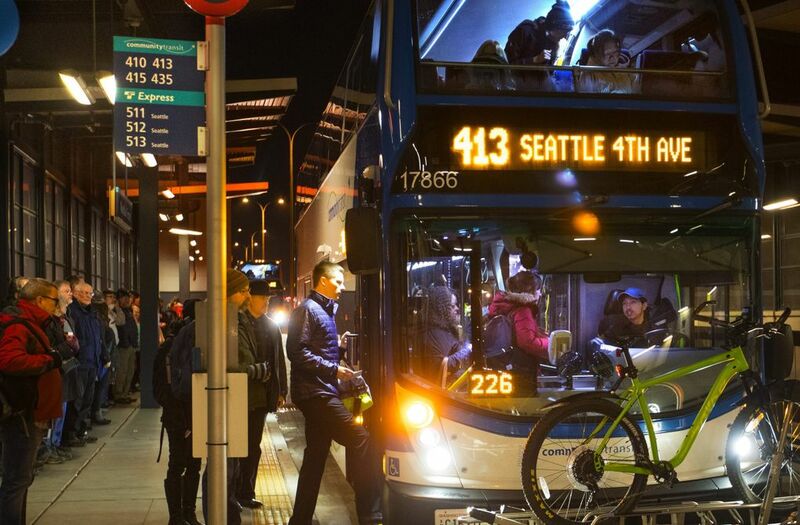 A few buses were delayed up to 30 minutes, from West Seattle and White Center, though there seemed to be plenty of capacity, said King County Metro Transit spokesman Jeff Switzer. Metro deployed 20 additional buses on standby to maintain frequent service. A temporary waterfront bus lane was striped by SDOT to help afternoon buses bypass the crowded King Street Station area, en route from downtown to West Seattle. 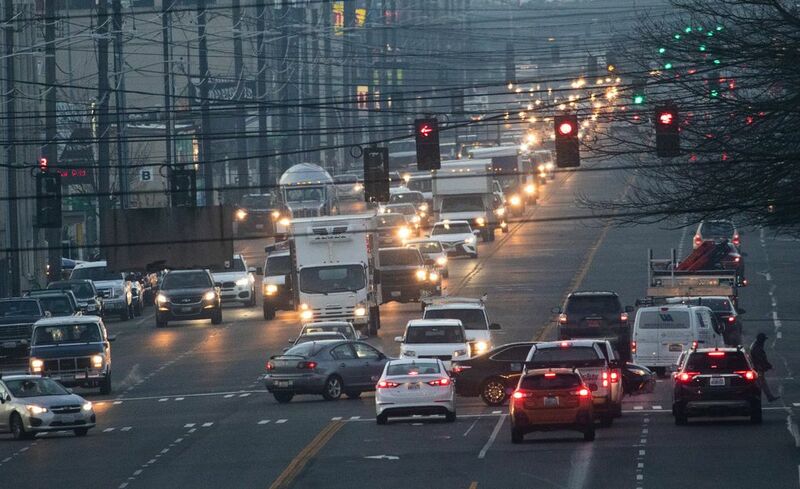 Buses on Aurora Avenue and downtown Seattle streets seemed more crowded than usual, but travel times remained relatively consistent with regular weekday averages, transit riders said. 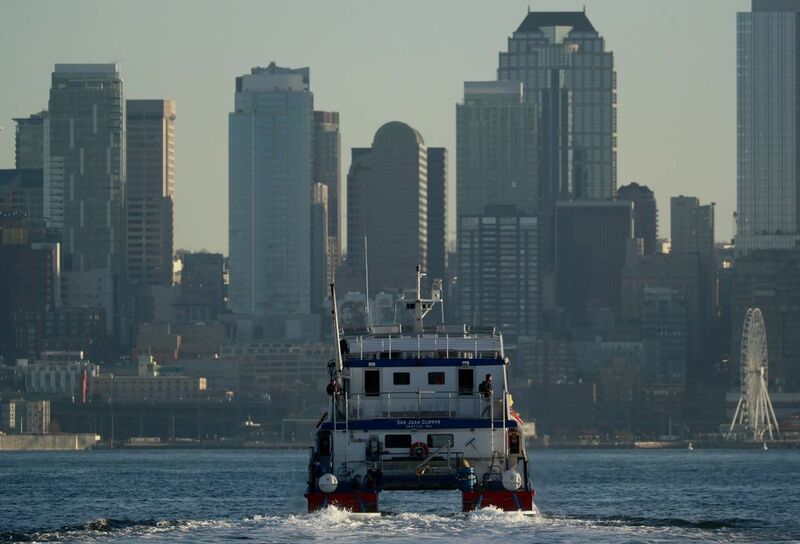 A highlight was the King County Water Taxi, where an extra boat allows sailings every 20 minutes and boosts capacity. “We’re telling folks, if you miss a vessel, you can see the next vessel,” said Metro spokesman Brent Champaco, standing dockside. Some boats before 7 a.m. left half-full, leaving some people onshore to keep its schedule. 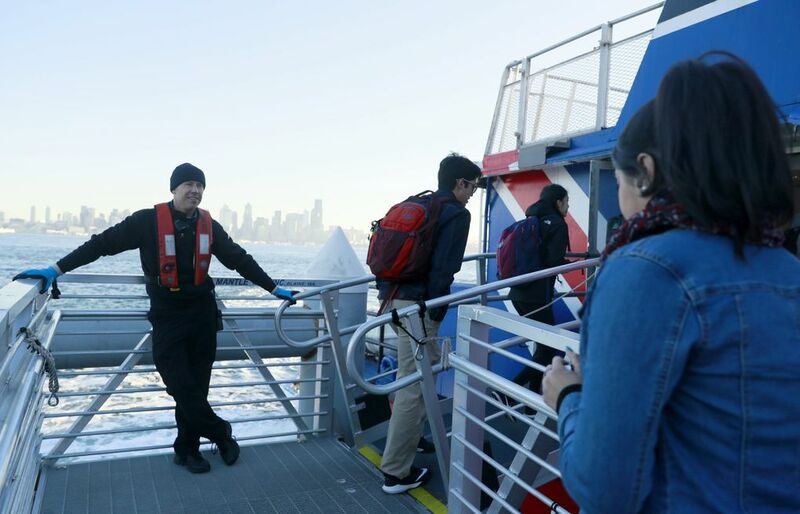 Plenty of room remains on the vessels, even though they carried a total 1,350 passengers Monday morning, compared with 350 normally. 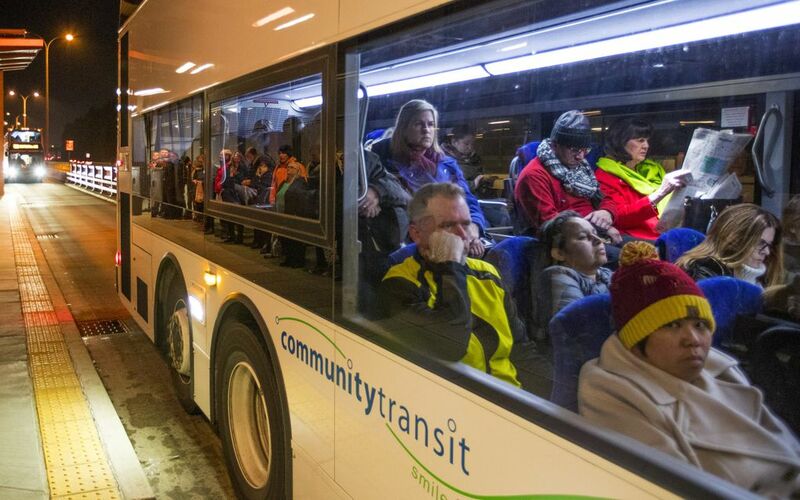 Shuttle buses from neighborhoods to the dock filled, and Metro may consider adding more. 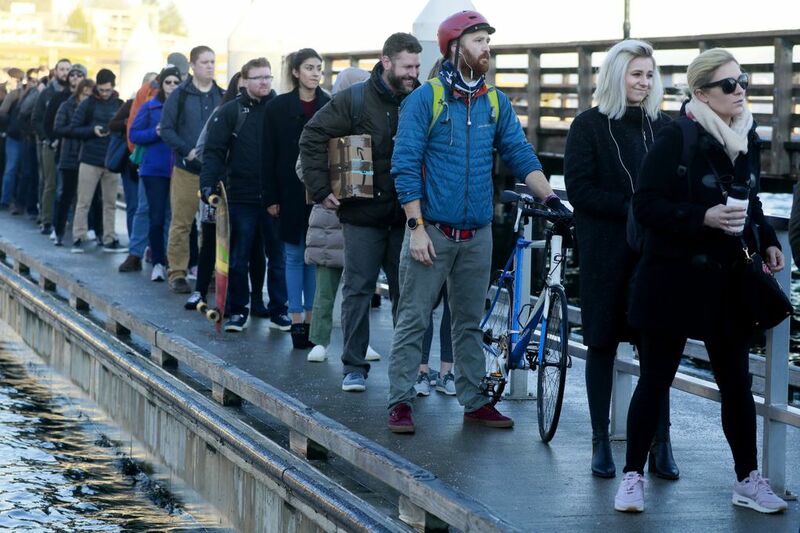 The on-demand Ride2 door-to-dock shuttle service carried 156 morning customers. 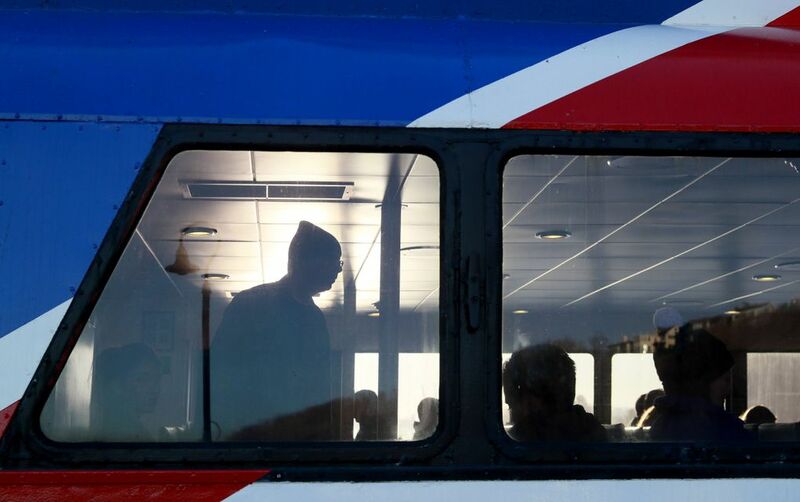 Kitsap Transit reported increased riders on its Bremerton and Kingston fast ferries to Seattle, led by the 7:05 a.m. Kingston departure with 165 passengers — 50 more than the same run carried Friday. Viaduct dread didn’t seem to make it to the Eastside. 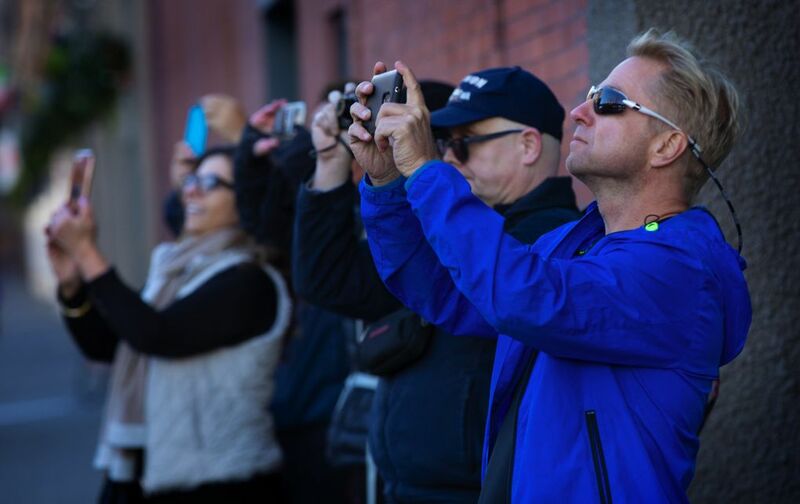 At the Eastgate Park and Ride, bus commuters were blasé about the shutdown, expecting no effects. Commuters lined up. Buses came and went. 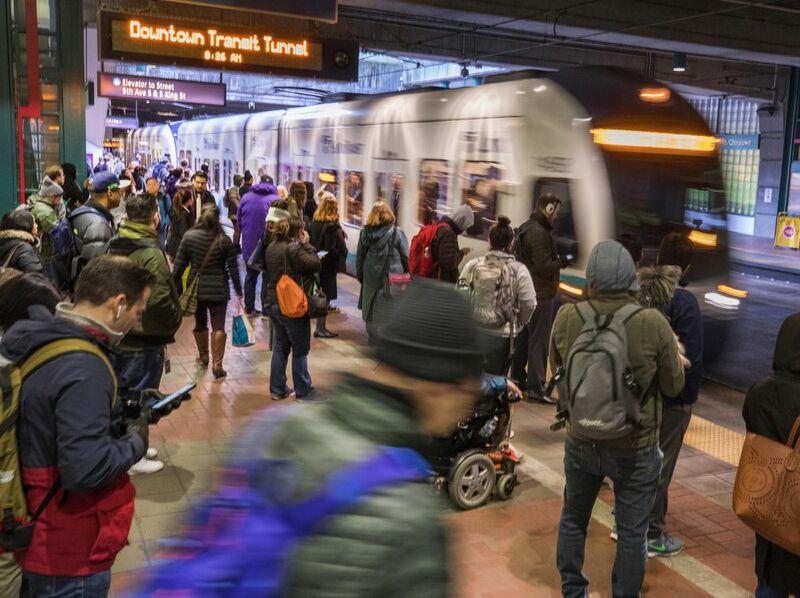 If anything, volumes seemed lower than usual, with parking spots in Eastgate’s 1,614-car garage still available at 9 a.m. On an average day, the garage is 100 percent filled. 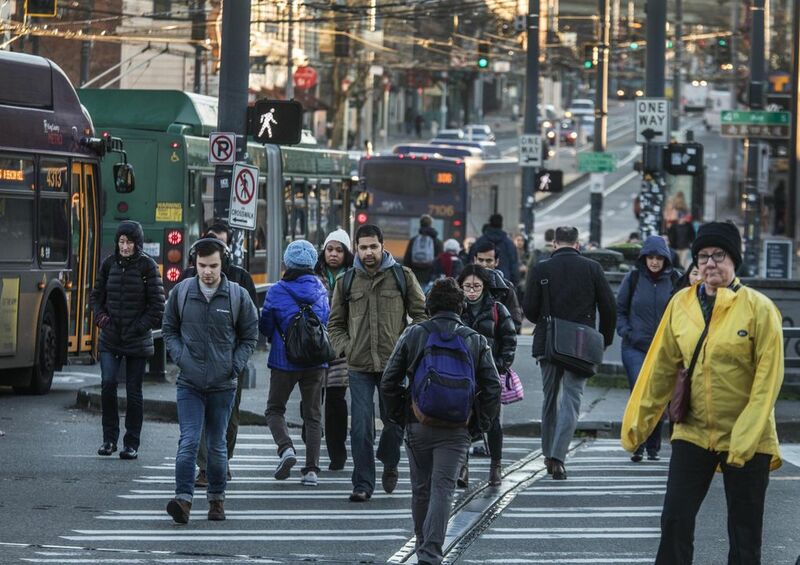 Ashley Kern, who lives about 2 miles from Eastgate, was waiting for the 212 bus to downtown Seattle, where she works as a medical scribe, at 7 a.m. — about 20 minutes earlier than normal. “Hopefully it’s enough,” she said. 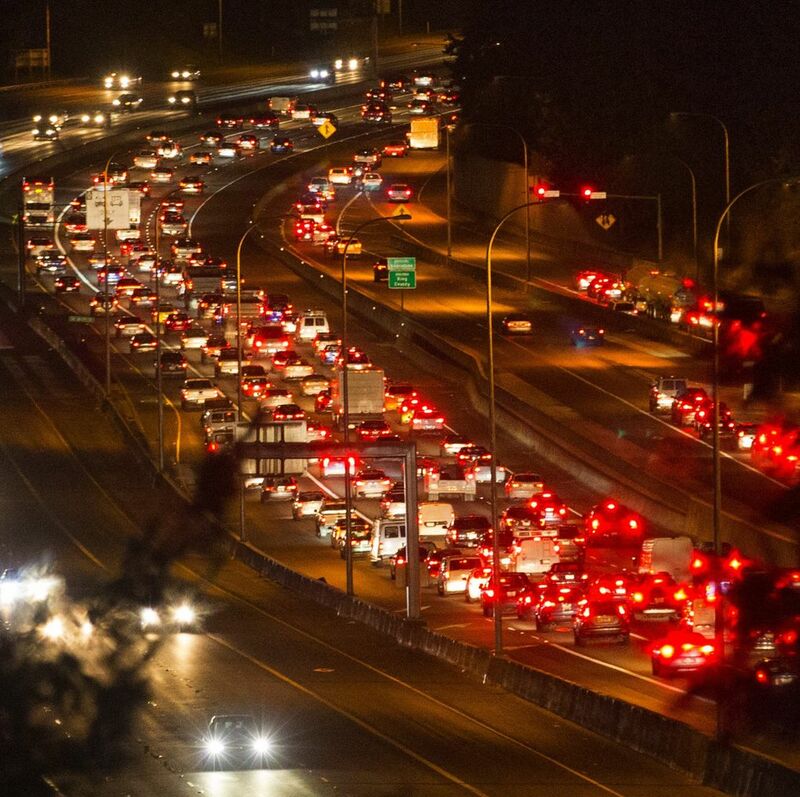 It’s unlikely that any other commuters — anywhere in the Seattle region — were as serene about the viaduct shutdown as Andrew Colson, who goes from Issaquah to Bellevue, via Eastgate. Not everything went well. 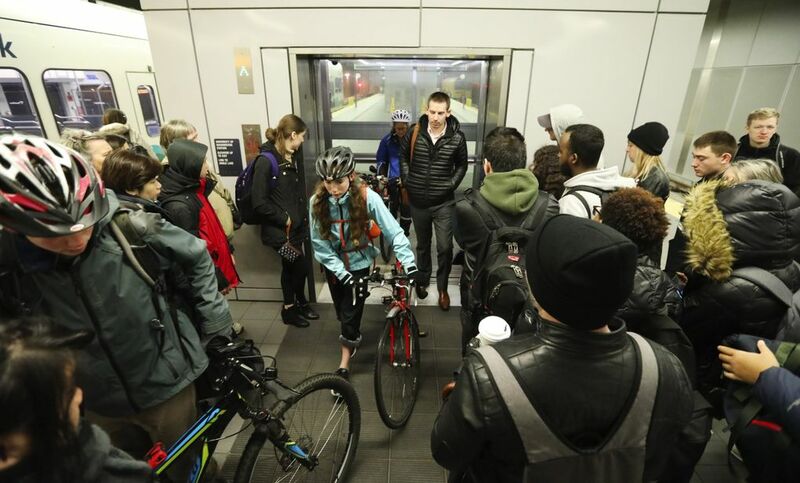 At busy Westlake Station, three of the four escalators were broken near Third Avenue and Pine Street, where at least one elevator remains closed for renovations. Staff reporters David Gutman, Michelle Baruchman and Evan Bush contributed to this report.